No Stupid Questions? Oh Yes There Is. I’ve been told there’s no such thing as a stupid question. And I suppose that’s true, at least in spirit. What they meant was “If you don’t know, ask. Don’t blunder along in the dark.” And trust me, I’ve done far too much blundering. It takes a certain humility to learn—the humility to admit you don’t know everything. But, there really is such a thing as a stupid question. Lemme ‘splain. At a previous workplace, a meat shop, I was tidying the store when a well-dressed gentleman walked in. I guessed by the accent that he was new in town. I really didn’t want to embarrass the guy, but I hadn’t the foggiest idea what he was talking about. Be cool, Geralyn. You’re a professional. “Ahh.” He nodded and smiled and took his leave. That is not a stupid question. He didn’t know. How else would he know if he didn’t ask? “Well, nothing I have here really cuts into nice steaks. I suppose we could cut a top-sirloin for you. That’s probably the cheapest option. But I have some nice sirloin steaks right here.” I pulled a couple from the cooler. Steam threatened to blow from of my ears. First he tried to con me into selling him good meat for cheap and now he was calling me names! I decided to appeal to a higher power. “Let me ask the butcher.” Henry happened to be nearby so I told him what this guy was looking for. So, out went the man with his daughter trailing behind him. I felt vindicated, and I never saw that guy again. Now that is dumb. I know I can’t please everyone, but if I’m going to discard critiques because I don’t like them, then why am I wasting time with a writing group? Learning requires humility. Its not as if we should blindly accept the answers we’re given. We must compare the answer given to the results of the answerer. If they’re a hundred grand in debt and living paycheque to paycheque, I wouldn’t take their financial advice, know what I mean? But if the results they have back up their answer, I’d better give it serious consideration. So, I suppose, it’s worth displaying a little ignorance now and then. 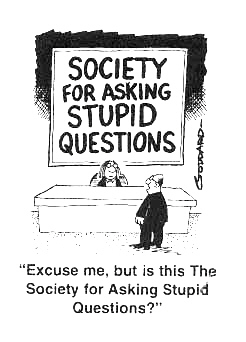 But keep in mind: there really such a thing as a stupid question. I’d love to hear from you. What’s a stupid question you’ve been asked? What stupid question have I been asked? That’s an easy one. I worked at a Canadian Tire for about a year or so, and with all due respect to the human beings that were our customers, I’ve heard some pretty dumb questions asked by them to the sales associates. Apparently, the name of the store he was in, Canadian Tire, left room for doubt in his mind whether or not we actually sold tires. In my own “Calm down, you’re a professional” moment, I coolly directed him towards the *automotive* section of the store, where one of our associates at the automotive desk would be glad to assist him. To me, walking into a Canadian Tire and asking if we have tires is like going to a McDonald’s and asking if they have burgers. Come on, man! !